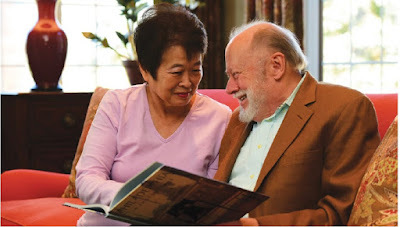 Previously from rural Connecticut, Margaret and George Petersson moved to Athertyn to be close to their son and his family, who live in Wynnewood. George, a chemistry research professor at Temple University, and Margaret, a happily retired psychotherapist, love the Athertyn community. How did you know Athertyn was the right place for you? Margaret: The architecture, quality, and ability to personalize were key features. George: We really love the pool and go nearly every day for a recreational swim. What are your neighbors at Athertyn like? Margaret: People here have thought about what they want out of this stage of life. They've planned carefully, considered the best setting and are committed to the lifestyle. How do you compare where you lived to Athertyn? George: Our former home of 30 years had a huge lawn and trees that needed maintenance. Our long driveway was constantly being plowed in the winter. At Athertyn, we enjoy maintenance-free living. What was it like working with the Pohlig team? Margaret: They always ask us, 'What can I do for you?' There is a sense of being genuinely cared for, which gives us great peace of mind. For that reason alone I'd recommend Pohlig.